My husband and I wake up at six in the morning, still a little groggy from last night’s wedding eve party. We are up in the small village of Buscalan in the Cordillera mountains. Weddings here are celebrated for two consecutive days and last night, it seemed that the whole village joined the revelry at the village ‘plaza’ which was, as luck would have it, only two steps away from Whang Od’s house. Hubby and I were so exhausted from the day’s 16-hour journey. But much as we wanted to sleep, Psy’s Gangnam Style blaring from the sound system every 30 minutes had us tossing and turning up until the wee hours of the morning. Despite our lack of sleep, we force ourselves to get up. It is going to be a long and painful day and we want to make sure we are Whang Od’s first skins of the day. As we make our way downstairs, we see the petite 93-year-old mambabatok (tattoo artist) already up and about, feeding her chickens while drinking her morning brew. In her very limited Tagalog, she asks us if we were able to sleep at all. We assure her that we’re okay and that she need not worry about us. After coffee, Whang Od tells us to go with her to the upper side of the village. It’s much quieter there and the seeming isolation is perfect for our tattooing session. As Whang Od prepares her tools, Hubby and I go over our design one last time. Before coming here, we talked about having a symbol to mark our 9th wedding anniversary. We also wanted something traditional in honor of Whang Od. Problem was, we had no idea how to go about looking for a traditional Kalinga design. Most of what we’ve seen were animal motifs, particularly centipedes and snakes. Both are beautiful but do not speak of us as a couple. Fortunately, we found a book lying around Whang Od’s house yesterday. “Filipino Tattoos Ancient to Modern” the title said. It was written by Lane Wilcken, a Filipino-American author and tattoo artist. It turns out that Whang Od and Kalinga tattooing have figured prominently in Lane’s book. As we turned the pages, we saw exactly what we were looking for. 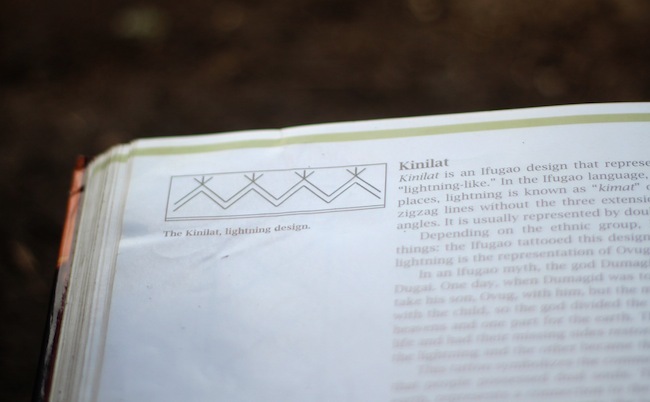 The Kinilat or lightning is one of the traditional batek (tatoo) motifs in Kalinga. Hubby shows the book to Whang Od and points at the illustration. She smiles and nods her approval. 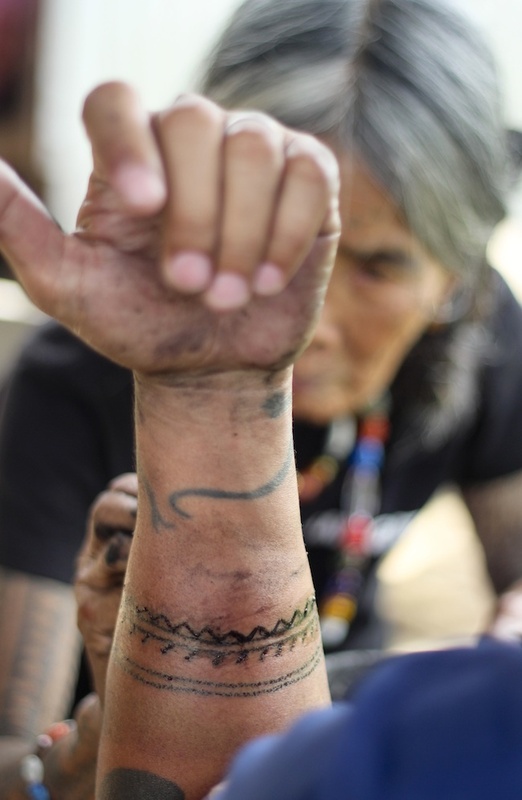 Hubby had previously requested that both Whang Od and her niece, Grace, give him his batek so that he can have one unified piece that would represent both the old and the new generation of Kalinga tattoo artists. 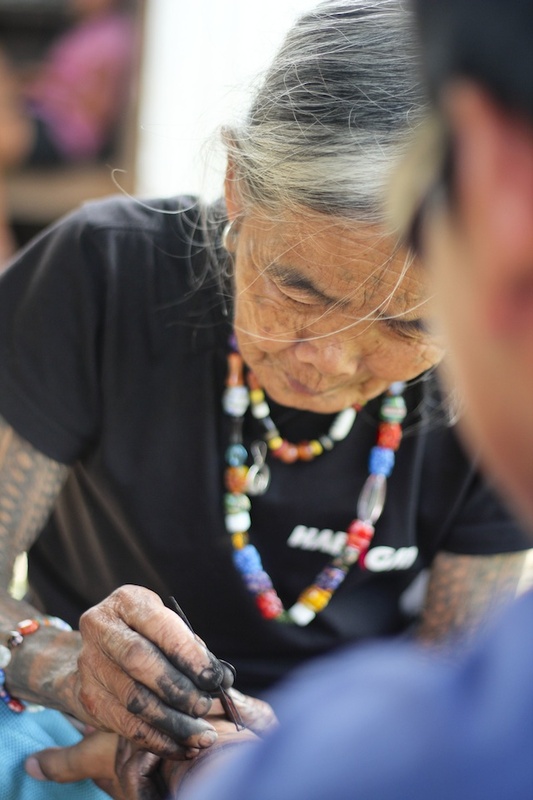 Whang Od has taught Grace the art of tattooing a few years ago but is unsure of whether Grace will continue the tradition. Grace is now in college, studying to become a teacher. From our encounters with her, we felt Grace’s heart is not really into tattooing. At least not yet. I hope she proves us wrong. UPDATE: The hubby just chatted with Grace and found out that Grace is still pretty much into tattooing. This is the best news we’ve heard in a long time! I’m glad she has proven us wrong. We hope that she continues this beautiful tradition and that in time, others will follow in her footsteps. The process of traditional tattooing is quite simple. First, Whang Od gathers soot from her cooking pans and mixes it with water to create the pasty ink. She then gets a blade of grass, dips it in the ink and uses it to create the pattern on the skin. Once the pattern is laid out, hand-tapping begins. Once the pattern is laid out, hand-tapping begins.For needle, Whang Od uses a pomelo thorn that she attaches to the end of a piece of bamboo. She smears the thorn with ink, then, using another piece of wood, taps it repeatedly into the skin until the skin absorbs the ink. Whang Od taps over the pattern two or three times to make sure the ink is absorbed completely. So basically, you get wounded two or three times on the same area until she is satisfied with the result and decides to move on. And because the thorn is not as smooth as a needle, the process becomes extra painful when the skin gets snagged on the thorn. Ouch! And because the thorn is not as smooth as a needle, the process becomes extra painful when the skin gets snagged on the thorn. I love the contrast between Apo Whang Od’s traditional sleeve and my husband’s Leo Zulueta-inspired neo-tribal one. Whang Od and Grace take turns working on Hubby’s batek. Before long, Hubby’s arm begins to swell. I can also see that he’s in extreme pain. In the olden days, tattooing sessions can last up to several months, depending on the size of the batek. The tattooed area can also stay swollen for several weeks. 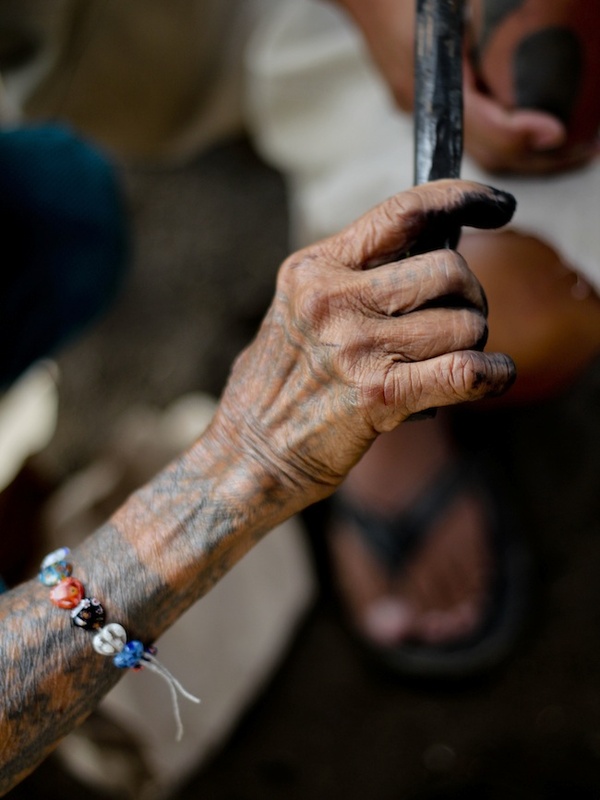 In the olden days, tattooing sessions can last up to several months, depending on the size of the batek. The tattooed area can also stay swollen for several weeks. Finally, after three and a half hours of tortuous tapping, Whang Od is satisfied with my husband’s batek. The thing about traditional tattooing is that nothing will (ever) prepare you for the pain. With machine-operated tattooing, the light buzz coming from the equipment is almost like a subtle signal for you to brace yourself. With traditional tattoo, silence is literally the calm before the storm. You will never be prepared for the assault on your skin, nor the pain that follows. It’s very tempting to block out the pain. But in essence, getting a batek is a spiritual experience. Thus, you have to savor the moment, no matter how painful or uncomfortable it is. In ancient times, tattooing used to be a sacred rite and tattoos were given only to the bravest men of the tribe. Women also received their tattoos as a rite of passage. My kinilat, as small as it is, is no less important, nor painful! At some point during the session, I start questioning my sanity. Why am I doing this again? Hubby will run a very high fever tonight. I know it in my bones. I can see that his body is already trying to reject the ink embedded in his skin. He disagrees, of course, but his swollen batek betrays him. As for me, I am a little guilty that my batek is way smaller than his. Still, I feel a sense of accomplishment. We have been marked by Whang Od, the last tattoo artist of Kalinga, a fitting way to celebrate nine happy years together. From afar I can see the mist creeping over the mountaintops. Rain is coming. But the villagers seem oblivious. There’s still that wedding celebration to think about. Already, the sound system is blaring music again. Thankfully, it’s not Gang Nam Style. At least not yet. Rain or shine, the Botbot Tribe will celebrate again tonight. And having been marked by Whang Od, we were invited to be part of the tribe, if only for one night. 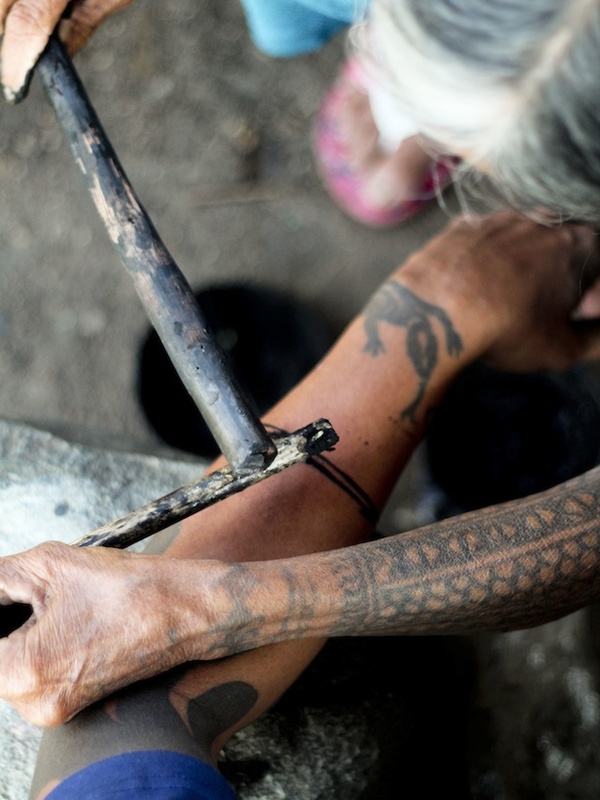 To know more about Kalinga Tattooing, read tattoo anthropologist Lars Krutak’s article here. You can also check out Lane Wilcken’s Filipino Tattoos Ancient to Modern Facebook page here. Love the design! Sigh, I wish Steve and I could have tattoos too, but I don’t think I can stand the pain. Hehehe. Hang on, I was in labor for two days before I had to undergo an emergency CS to take Tamsin out. Kaso nga lang, I had gas & air for that. Di kaya pwede, may gas & air din pag nag papa-tatoo? Hehe. Inge, yes you can have a topical anesthetic! 🙂 kaya lang baka pagtawanan ka ni Whang Od! It’s Apr 21st. I wonder if you ever pushed through with your trip! I hope you got your batek! Hi! Yes, we made our trip. It was amazing. Definitely a once in a lifetime experience and a great adventure. We all got our bateks, and they are perfect. My mom’s actually seems a bit infected, but doing ok. It was a long and even exhausting trip, but totally worth it. Hi Marj. Between the two us, Hubby and I have 13 or 14 tats. But Whang Od’s are the best, not just because of the way they were done but especially because of the story behind them. Thank you so much for your kind words. I’m sure you’ll have a blast in Buscalan! Nice read, nice tattoo, nice couple! 🙂 congrats saindong duwa for the 9 years together. Hi Don! Thanks from both of us! Hope you’re doing well. :) Stay safe! Thank you, Kat! And thanks for stopping by. 🙂 Safe travels! Great post, Pol, I’m not really keen on tattoos but I enjoyed reading your adventure to meet and get inked by the great Whang Od. Love the photos and how you described the process: “because the thorn is not as smooth as a needle, the process becomes extra painful when the skin gets snagged on the thorn” araykupu! I could almost feel the pain. (Threading nga lang I already question my sanity halfway through–do we really need groomed eybrows? !–ito pa) I salute you. Oh and congratulations on the AFAR online shoutout! 🙂 Yahooooooo! Idol! Thanks, Kristian! And great job on the Baybayin! i have two tattoos on my back… and sabi ko i want my next tattoo to be traditional and sa kalinga… the next art i want is meaningful. and i was more encouraged by your post! ask ko lang po… how much did you pay for the tattoo? Really? When?! I’m excited for you! Hi po! Does one need to have tetanus vaccine ba before this? She changes din po ung parang needle? I would lovew to try this one day… Awesome tattoo right there. whang od is amazing. Hi po, were planning to go there on dec 4 to 9. sagada muna kami until saturday lunch time, then diretso kami to buscalan. question is we dont know hot to get there. maybe u can help us out po. trip namin back is monday morning. kaya po ba? please contact me po. 0932 9212329. thanks. After your session, don’t wash your wound right away to let the pigment seep in. Let it rest for maybe a couple of hours. Just clean the area around the wound. When the swelling has subsided, you can wash your wound with soap and water using only your hand. Pat dry and put some antibacterial ointment if you have. Whang Od does not have any bandages so you should bring your own if you want to cover the wound. As for us, we just put petroleum jelly over our new tats. We did this daily for about a week until the wound has completely healed. Wow the weather will be very nice if you’re going next weekend. Let us know how it goes! Good luck and stay safe! Where did you buy your bandages? am planning to have a tattoo from wang-od on november. 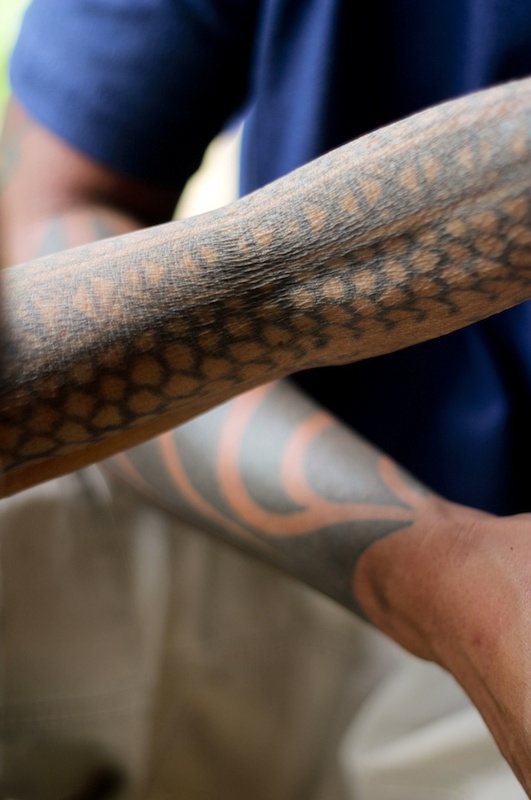 just wondering, i know kalinga tattoo patterns have their own meaning. i want the necklace-like tattoo, like the one on wang-od’s upper chest. is it possible? Loved how you captured the experience. Been wanting to do this for the longest time, but was clueless on how to go on about it. Thanks for sharing your story. When time permits, in a month or so, might just go and do it. Could you please send me an e-mail re how to get in touch with you. Thanks again. Hi, I’m really glad I came across your articles because they have been the most useful ones I’ve found so far. I’ve been meaning to visit her but never had the proper opportunity or company to do so. However, it’s my 21st birthday in 2 weeks and I’d really love to have it done as a gift to myself. By any chance would you two be willing to accompany me? This would be my first time to travel alone. So sorry for the late reply. Advanced happy birthday! What a perfect way to celebrate. Unfortunately, we are very busy at the moment and won’t be able to travel any time soon. I hope you’ll be able to find a travel companion. Please make sure to travel with someone ha, or get a guide. :) Good luck! hi, cara! was thinking of the same thing: to get inked by whang od for my 30th birthday in october. 😀 unlike you, i’m used to travelling alone, and have been scheduling solo trips at least once a year for 5 years already. please tell us how it goes, if you’d happen to travel alone. Hi cara! 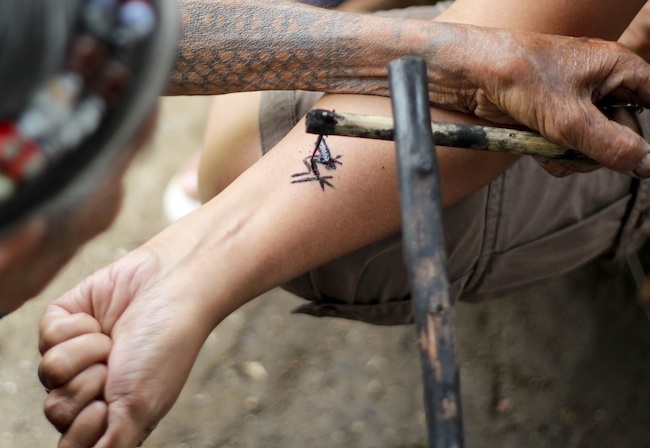 Were you able to go to buscalan and get inked? If not, i’m planning to go there next week. I’m in sagada at the moment, also traveling solo. Amazing entry! I am an American living in Manila and stumbled upon your blog when searching where in the Philippines I could get a traditional tattoo. Would love to connect with you! Thanks! Wonderful! Yes, October would work out well for me! Looking forward to hearing more! Thanks again! I’m really excited! I’ve been wanting to get a tattoo by Whang Od but I have no idea where to start. I am overjoyed to have found this. 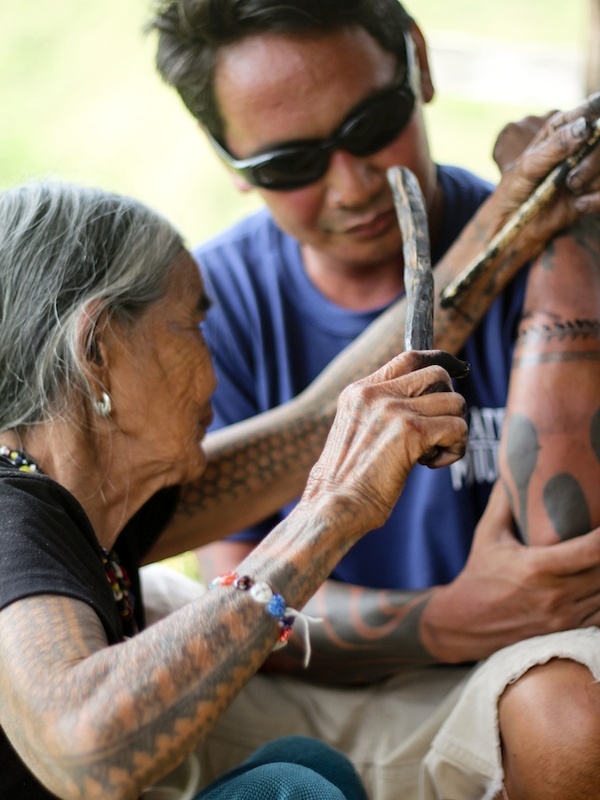 I am planning on visiting my mother in Bohol, but I do want to get a Kalinga tattoo. I can’t think of a better way to pay my respects to the history of my culture. I have a few other questions, but I’ll wait for an email to ask. I’m glad you’re excited. You can e-mail me your questions at polmangilog@yahoo.com. Hello, I really enjoyed reading this page. It brings me a lot of ideas of what kind of tattoo design to get. I’m thinking to have Tattoo in Philippines when I visit next year. Wow, you’re both really brave and they look beautiful. Amazing photographs and description. This is one of the most interesting articles I’ve read in a long time. I just got my own tattoo last Sunday. And we actually made it there with the help of your blog, so thank you for posting these helpful tips! I am concerned though with the aftercare, (I have only seen one blog who actually talked about the healing process of her tattoo). Do you know anyone who actually got sick after? Or had an infection? I haven’t had a tetanus shot and I’m wondering if I should still get one. Thanks for the helpful posts! I am having this idea of going in Kalinga solo most probably by Feb 8 and back home by feb 10. When are you and your mom going there? This is my first time to ever travel alone, and it’s my bday then. Do the tattoos have a price? Or something in exchange? Hello. I am planning to do an ocular visit para makapag outreach program dito sa remote areas dito sa place na ito. Do you have any contacts? Like a teacher or barangay captain? To know more of our outreach, you can visit this link http://www.ann-d-explorer.com/p/uncategorize.html Hope to hear from you. Never been in this area and planning to mag DIY as di ko yata kaya TF nyo hehehehe thank you so much. This blog is reallly ab g help. Your website is fantastic. I’ve been to the Philippines once before (Manila, Taal Volcano, Donsol, Palawan) and am planning to return for about 10 days in February. My friend and I are looking for unique experiences, like the Enchanted river in the south, definitely going back to Donsol, and I found this information about going to Kalinga, I’d be interested in a small tattoo like yours with Whang Od, and seeing some of the local rice farming and crafts. We live in Korea (not Korean) and we don’t speak a lick of Tagalog so I’m trying to find some people to guide for certain areas like this. I’m not sure if you’d be available during this time, but we are planning to go from the 9th or so until the 20-23rd, either starting in the north or south, probably starting in the south if I plan to do the tattoo. The tattoo isn’t a major necessity but it would be an honour from such a woman. Any information or anything would be great! hi! so thankful that you posted this. it’s really helpful. i’ve been searching the net on how to get a tattoo from Whang-Od. your blog came up and found out that you are offering guided tours in Buscalan. i’m interested. do you have any guided tours around March or April? I would like to get some information on your guided tours to reach Whang Od from Manila. This would be somewhere around April 17th-ish, if this is at all possible. Though I originally planned to just do this alone, I am not sure if this is even a good idea to begin with. the wife and I are planning on going there this April. If you and the hubby are not busy maybe we can get a group together to go? Please let me know. Thank you for your comment. It’s good to hear that you’re interested to have a similar experience. Unfortunately, I am somewhere in Europe at the moment and won’t be back till first week of August. Please keep checking out my FB page to get updates IF we will indeed do guided tours to Buscalan. I just had my tattoo done last April. Regarding pomelo thorns, we (our group) asked our local tour guide if we can bring the thorns that was used (to us) as a souvenir. He obliged and prepared new pomelo thorns for us which we brought home as souvenir. Last April 30 I had the experienced of getting inked by the Great Whang Od. Though, her eyesight and long queue prohibits her in doing the design (I had mine done by her great grand niece) she did her three dots signature and it was enough for me. Thank you for your article, I was introduced and inspired to have my first ever tattoo done by Whang Od which is more meaningful to me. God bless and continue writing…..
That’s wonderful! I’m soooo happy for you. THank you for your kind words. Do you mind if I share your feedback on the PinayTraveller FB page? Sure! By all means. You may post my comment in your FB page. How much do you usually charge to be our guide? Unfortunately, I am somewhere in Europe at the moment and won’t be back till first week of August. Please keep checking out my FB page to get updates IF we will indeed do guided tours to Buscalan. Good day! My friends and I are interested on getting tattooed by Apo Whang-Od. But, we need assistance and how to get there and get back to Manila. We plan to leave on Nov.22 early in the morning then get back to Manila. around early afternoon of the 24th so that we could catch our flight. We would be willing to pay too! Hi, I’ve read your blog and I’m a fan of it by the way. You’re blog is so updated and the information are so complete. I would like to ask for your assistance because I’m really clueless when it comes to places in Luzon. My girlfriend and I are planning to Visit Apo Whang-Od this April and we are planning to boom our flights this October. By the way we are from Cebu City. Can you help us how many days it would take for us to go to Apo Whang-od and also we are planning to Go to Mt. Pulag after going to Buscalan or go to Sagada. I really need help in plotting out itinerary from Manila to Apo Whang od then from there to Mt. 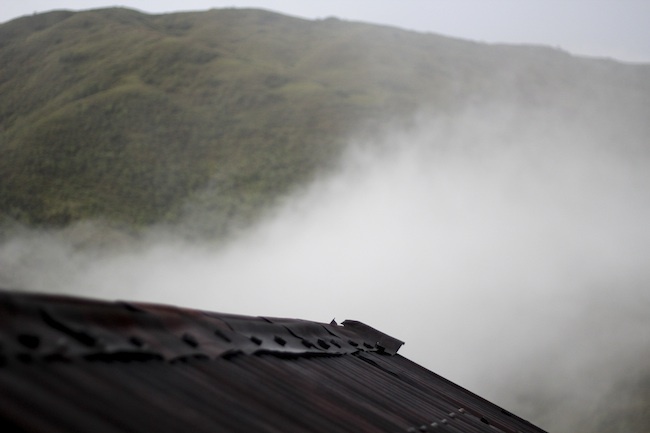 Pulag and or Sagada. Hoping you could help us out. Thank you!! Hi Carla, not sure if you also wrote me in FB. But thanks for your lovely comment. I hope you made it to Buscalan! Belated happy birthday! I hope you made it there! If I’m going to get inked by Whang Od, do I need to pay her? And how much po? Hi, thanks for this amazing post! I’m a postgraduate student hoping to make a documentary short film on Whang Od to be shown as my Master’s thesis here in London. As a Filipina with roots in the Cordilleras, I’m hoping to create a film focused on the tradition, the history, and the craft of what Whang Od does, and how she hopes to pass it onto future generations, starting with her granddaughter. Is it possible to communicate with you via e-mail just so that I can get some starter tips on how to get in touch with Whang Od to spend a week or so with her for filming and interviews? I would be so grateful for your guidance! I would like to know how to make an appointment with Apo Whang Of please. magkano po mgpatattoo kay Apo Wang Od? Hello! Tanong ko lang po kung magkano yung expenses ninyong dalawa all in at ilang araw po kayo nagstay? Me and my boyfriend have been planning about this for a while now. Wala lang kami matanungan na friends. Thanks in advance! I want to go to Apo Whang Od. Ive been dreaming to for years now. But I do not know where to start. Im planning to go to Baguio for the thansgiving. But what bus to ride? And where to? Or is there anybody who can accomodate me? Your journey and experience may come handy. Thanks. Hello:) I am half Filipino and half European. My mother is from Malasiqui, Pangasinang Philippines. I visited when I was 15. My mother and I are going back in March 2016 to bury my Auntie, and the ONE thing I wanted was to get a traditional tattoo from Whang-od. Do you know how I can contact her or someone that can put me in touch with her? This may be our last time going back home and i would very much like to have a piece of my heritage with me. Thank you and I look forward to hearing from you. How much is her fee? Hi. How to get to Apo Whang Od’s place? I really want to get tattoed by her. And how much does the tattoo costs you? Pls email me. kareenamiranda1@yahoo.com. Thank you. hi! thanks for the nice info you have given us!! how much do you think it would cost everything starting to manila and back? and i was wondering how much does whang od inks cost? thanks! I am planning to get a tattoo. I want to drive my big bike there. My question is where do I park it if I want to stay a night. Hi! May I ask how to get to Whang od’s place? My and my partner are planning to get inked by her. How did u chatted grace by the way?? Im planning to go to tinglayan but do we still need some tour guide? I am a rider so can we use our motorcycle to go to tinglayan?? Hi. Wondering if you made it to Tinglayan. Give us an update! How do you go about making an appointment with her? Hi Randy. i’m Caden. Thank so much that info in your blog. Well done. I’m very interested in whang Od’s tattoo design. So i plan to go there to get one also. But the thorn picked from the lemon tree that i concern more. May i know is it always will replace a new one after one used??? Thank you. Hi caden, I just saw your question here and even I am not the one you’re asking I would like to help you. Based on our experience, the young ones (Grace, Elyang and others) are cautious and always replacing the thorn, however, Apo wang od is different. During our time (February 2017) she just replaced the thorn when I asked the guide to tell her to replace the thorn. She replaced it right away…. you must insist it because I think she really don’t change it not unless insisted. Hi Kat! Thank you so much for that info and for answering Caden. I’m glad you were able to get you tats. Happy travels! Honestly, I was there end november 2015 it was a Filipino holiday, the place was flooded with people wanting to get tats ( 25+ queue at apo, 15+ at grace and elyang). In the period I was there despite the huge amount of people Whang Od changed the thorn with each and every one of them. You have absolutely nothing to worry about, this is an experience of a lifetime. That’s good to know, Lou. Thanks for letting us know about it! Omg. That’s a lot of people to wait. hahaha ok. thanks Lou for your info also. Besides, i’m still finding a tour guide to that place. Any tour guide contact that you can recommend me?? I have tried give them a call but those numbers i unable to access them. How you contact them?? Do they use watsaap? Email? I did Manila – Baguio – Bontoc by bus, went to the jeepneypoint to get to Tinglayan first. Clearly in Bontoc they’re not used to see foreigners, especially 6’5 ones. We had decided to spend a night in Tinglayan first, I can’t remember the name but there were only 2 “hotels” at that time. It was 200pesos a night I believe. This hotel had a guide sitting outside, I think his name was Victor and he set us up with his son to guide us. There are a bunch of guides in Tinglayan too, so I didn’t feel like you really needed to book one up front. As we arrived at the drop off point ( we hiked all the way, no habal habal for the first mile ) there were also a bunch of guides sitting there. I think they know how popular she is and are pretty much waiting daily for people to go see her. Wow. Really?? Thanks Kat for replying my question. Ya for sure i will insist them to replace a new one. Besides, i’m still finding a tour guide to that place. Any tour guide contact that you can recommend me?? I have tried give them a call but those numbers i unable to access them. How you contact them?? Do they use watsaap? Email? Hello! I love the tattoo. New lng un sa akin.. Pwede ko po ba makita your healed tattoo po? Thank you! hi. my name is Barry and I don’t have any training in mountain climbing or trekking but I really want to climb that peak going to apo whang od. I’m not really fit, do u think I cna manage to climb the mountain successfully? or would u suggest not to? but I’m. really eager to give it a try. Hi Barry. Perhaps a couple of days of trekking before you actually go to Whang Od would help. But there’s really no need to train. 🙂 I was also not very fit but I was able to do it. Just take your time and enjoy the trek.